Minnesota Wild forward Luke Kunin was the first sophomore to captain the Wisconsin Badgers in 40 years. For nine years, the Minnesota Wild operated without a fixed captain. The “C” changed hands again and again from 2000-09, before then-head coach Todd Richards named Mikko Koivu the Wild’s first full-time captain, when the stoic Finn was 26. Koivu, now 34, has held the position ever since. In 19-year-old prospect Luke Kunin, the Wild may have found their captain of the future. 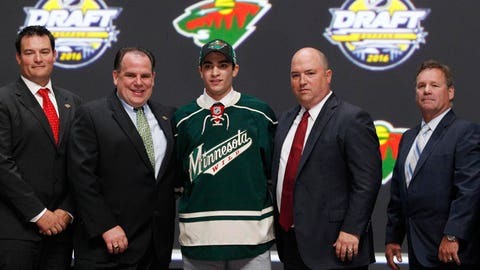 The Wild’s first-round pick in 2016, Kunin signed with Minnesota earlier this year following his sophomore season at the University of Wisconsin, where first-year head coach Tony Granato appointed him one of the youngest captains in the program’s history. Kunin was the first sophomore to captain the Badgers in more than 40 years, and the second in their history. He took the added responsibility in stride, leading Wisconsin in scoring with 22 goals and 38 points, helping the Badgers to their best finish since the 2013-14 season. His leadership, Granato says, showed up everywhere. “There were plenty of times during the year, whether it’s on the bench, whether it’s in practice, whether it’s away from the rink, where he’d turn to us coaches and say ‘I’ve got this under control,'” Granato told FOX Sports North. Granato’s brother Don coached Kunin for two years at the U.S. National Team Development Program in Michigan, where he captained a star-studded U-18 team that featured players like NHL-bound Clayton Keller and uber-prospect Auston Matthews. He took up the mantle again in December, when he captained the U-20 team to gold at the World Junior Championships. Kunin was on hand for the Wild’s player development camp earlier this month and made a big impression on Director of Player Development Brad Bombardir, himself a former Wild captain. For his part, Kunin is open to a bit more learning. Leading, he says, means learning. “[Leaders are] always learning, always soaking up information, whether it’s from players, coaches; just the little things you can do to always get better,” Kunin said. After watching him tear through the NCAA, where he often competed against players 3-4 years his senior, Granato is adamant about Kunin’s chances in the pros. But while goals will take him far in the NHL, Kunin’s versatility could be the thing that accelerates his path to the big leagues. Kunin isn’t particular about where he plays. For Kunin, it’s all about making the team. “Whatever they want me to play, what position and where throughout the lineup, it’s up to them, but that’s my goal and that’s what I’m trying to do,” Kunin said. He took another step forward in March, when he left the Badgers to finish out the season with the AHL’s Iowa Wild. He scored five goals in 12 games, making headlines in just his third pro game with a hat trick. Whenever Kunin gets to the NHL, Granato doesn’t think it will take him long to acclimate.